This is the remarkable story of two men and their respective problems. Two men in America (the South) around the same time, from completely different backgrounds, whose lives merged, and they became friends. When I read on page three, "...who got beat till you couldn't tell who he was no more," I knew I was in for something with this book. Having grown up (not proudly) in apartheid South Africa, and having seen and heard how people of color were spoken to (thankfully I never witnessed anything else that I can recall), my heart broke with shame and embarrassment at being white. As did it when I read this: "...'cause I know what it's like to get beat down for bein born with different-colored skin. And I know what it's like to walk around with my eyes down low to keep it from happenin again." Just imagine it. It hurts. It has to hurt. This wonderfully moving account is of how two men met, became involved in the problems and circumstances of not only their own lives, but in the lives of those around them. It's the story of how their eyes were opened and what they saw that was going on around them, and inside of them. I was emotionally moved to the point of crying by this touching story. All the people involved in this story truly looked into themselves, voluntarily opened up, communicated, and accepted each other for who they were. A valuable lesson for everyone in any society. The harrowing life of one man, the relative certainty and comfort of another, and the gritty determination and boundless love of the woman in between will keep you turning pages until you're through. It's as though at the same time in life, they met at the middle of a big X. Fate? God? Happenstance? Take from their story what you will - it's a beautiful one. 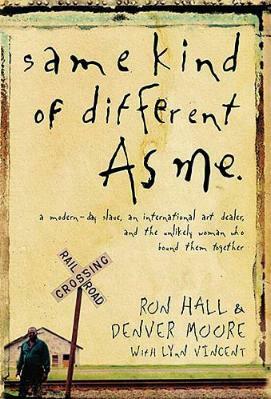 Visit the authors' website at www.samekindofdifferentasme.com. See their second book, What Difference Do It Make? Conclusion - Extremely moving, uplifting, and motivating, despite the sadness.